Thunderstorms are some of the most spectacular events in nature, yet what we can see from the surface of our planet is only the beginning. There are bizarre goings on in Earth's upper atmosphere, and a new mission aims to learn more about them.Launched to the International Space Station on Monday, the Atmosphere-Space Interactions Monitor (ASIM) will observe the strange electrical phenomena that occur above thunderstorms. Orbiting at an altitude of just over 400km, the ISS provides the perfect view of Earth's turbulent weather systems.ASIM will be deployed aboard the station later this month. 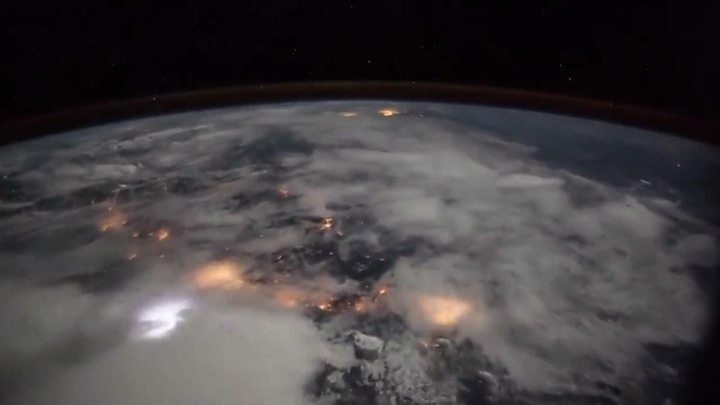 The electrifying effects of storms are frequently observed from the space station.Yet when lightning strikes downward, something very different is happening above the cloud tops.Known as Transient Luminous Events (TLEs), these unusual features were first spotted by accident in 1989. 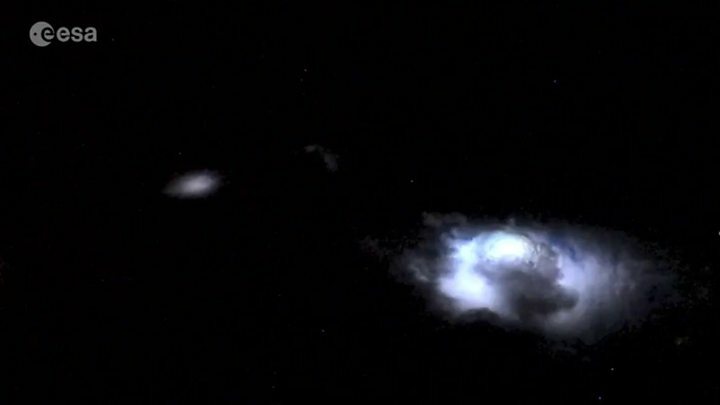 Minnesota professor John R Winckler was testing a television camera in advance of an upcoming rocket launch, when he realised that two frames showed bright columns of light above a distant storm cloud. The discovery came as a shock to scientists at the time, according to Dr Torsten Neubert, ASIM's lead scientist. "That really surprised all of us. How come this exists and we didn't know it[/img]For the better part of a century before TLEs were caught on camera, people who spotted them had been reporting "rocket lightning" or "upward lightning".Now in need of names, the phenomena were christened sprites and elves because of their fleeting, mysterious nature.Yet despite their diminutive monikers, these features are anything but small, and extend tens of kilometres into the atmosphere. So, what's causing these events? "They are slightly different to lightning," Dr Neubert told BBC News. "It's a pulse of the electric field that travels up. For the sprite - when the atmosphere gets thin, the field can get a discharge." Sprites appear milliseconds after a powerful cloud-to-ground lightning strike.Elves, on the other hand, are caused by the electromagnetic pulse the strike produces. A brief, aurora-like expanding halo in the ionosphere, they occur too quickly to be spotted by the human eye and last less than a millisecond.Although they are more elusive, "elves are incredibly well understood," says Dr Martin Fullekrug from the University of Bath. They are the most common TLE, thought to occur twice as often as sprites. Blue jets - upward electrical discharges from cloud tops - are the least well known. "The jets are not very well studied because they're very faint. They're mainly blue. Also they're not necessarily associated with lightning. They pop up now and again and they're very mysterious," Dr Fullekrug added.While elves are mainly spotted over warm ocean waters, sprites tend to occur over land.North America, the Democratic Republic of the Congo and South Africa are all good places to see them. But it is possible to spot sprites elsewhere.A normal summer thunderstorm in the UK is about 10km wide. Sprites appear above mesoscale convective systems - storm complexes about 10 times larger. "In Britain we also have [these storms] from time to time," explained Dr Fullekrug. "We're conducting research on one that happened in May last year. It produced a wonderful sequence of sprites [over Cornwall]. "The sprites were spotted by meteor observers, who had cameras trained on the sky to follow the trails of shooting stars. ASIM's main goals are to study the physics of TLEs, and the characteristics of thunderstorms that produce them.The payload includes two cameras, which can capture 12 frames per second, plus X-ray and gamma ray detectors.This will allow the international team of researchers, for many of whom this is the culmination of decades of work, to determine where in the cloud sprites or jets originate. With the aid of the European Space Agency, ASIM's minimum mission length is two years. During this period, it is expected to observe a minimum of one TLE per day, although it is thought that they occur at least every minute, somewhere in the world.For Dr Neubert, this will be an incredibly exciting time. "We don't really know what's inside lighting. It happens so fast and it's so dangerous... it's hard to get to the real inside physics," he said.In the thin upper atmosphere, TLEs are larger and easier to measure. "To me," he added, "they represent a window to the inside of lightning."